Tiagua 81 is an original Canarian country home which dates back to the 19th century and has now been restored into a cluster of stylish apartments. Whether you’re here as an individual, a couple, a family or a large group, there is a space here to accommodate you. 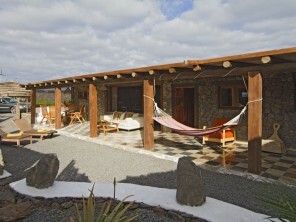 The finca is made up of four apartments and one detached cottage which can either be rented individually or together. Each property is thoughtfully kitted out and self-contained, but there are also a number of shared features, not least the saltwater swimming pool, that every guest can enjoy. And Tiagua is the perfect base from which to explore the island from north to south, whether you want to go trekking, surfing or sightseeing. 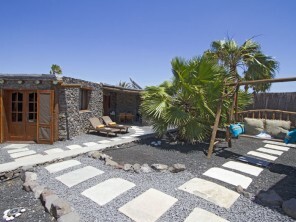 Tiagua is a traditional farming village right in the heart of Lanzarote. 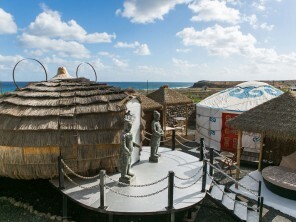 Within the village there are two restaurants serving local food, and within a 10 minute drive you will find the long golden Famara Beach, the La Santa coastline which is a stretch of surfing heaven, the stunning Timanfaya Volcanic National Park and the lovely mountain village of Teguise (the original capital). Arrieta and Papagayo are other popular beaches that are well worth visitingor you could take a boat trip over to the tiny yet beautiful island of La Graciosa. 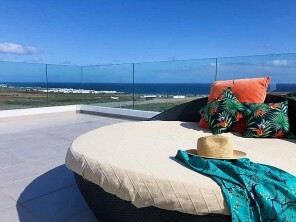 And don’t forget that Lanzarote is an outdoor pursuits paradise – go walking, biking, swimming, surfing, windsurfing, paragliding, fishing, bird watching and wine tasting. Arrecife airport is just 15km away (about a 25 minute drive), as is the ferry terminal. There is a bus stop 200 metres from the property. Flights to Lanzarote are available with Monarch, Thomson, Thomas Cook, Easyjet, Jet2com and Ryanair. The apartments are named after the island’s most popular wines and have all been furnished in a light, contemporary style. 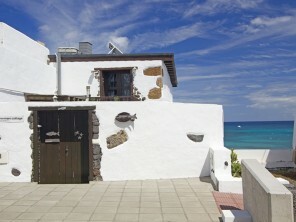 Mozaga is a studio with one en-suite bedroom and a cosy living/dining/kitchen area which features an original bread oven door, Bermejo also has one bedroom but spreads out over two storeys, El Grifo is another studio with a skylight for stargazing, and Reymar has one en-suite bedroom. Rubicon Cottage is set amongst the gardens of Tiagua 81 and features two bedrooms and a light open-plan living space. All the apartments are set around an enclosed central courtyard complete with sofas, WiFi and a shared reading room. Other shared features include a solar heated salt water swimming pool, a utility/laundry room, a BBQ and an outdoor dining area. The cottage has a private walled terrace, complete with sun loungers, BBQ and dining furniture. A deposit of 30% is required to secure your booking and the balance is due 1 month prior to arrival. Please arrive any time after 2pm and depart before 10am. A basic welcome pack is included.